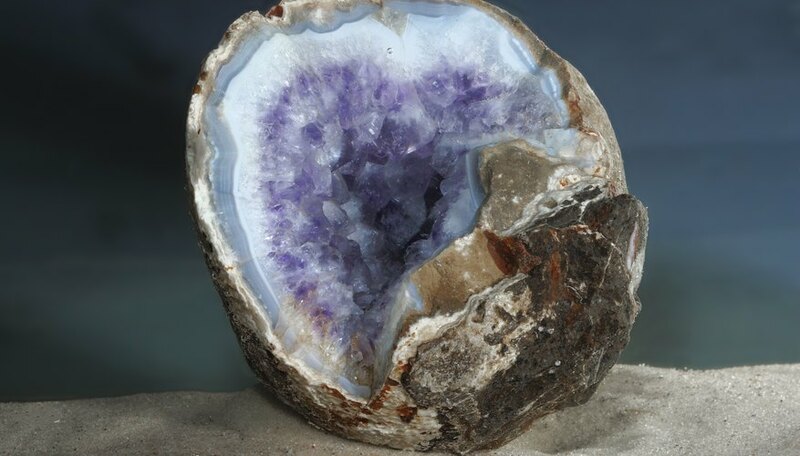 A geode is a beauty of the natural world, consisting of a round rock that contains crystallized minerals on the inside. 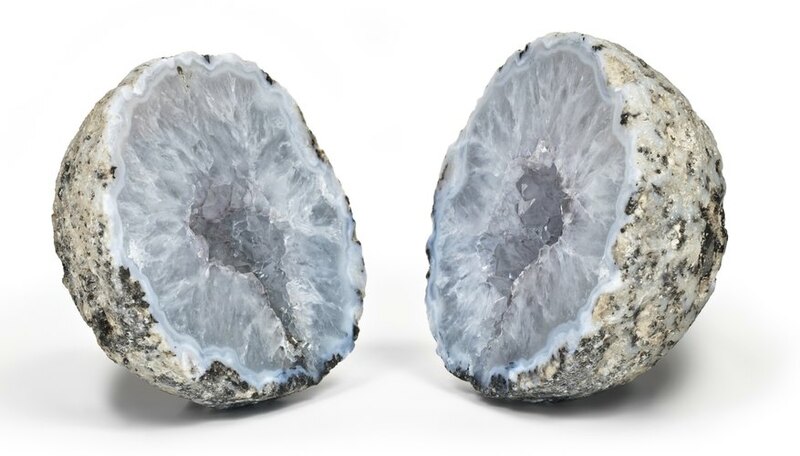 Before opening a geode, it is impossible to know exactly what if anything is on the inside. Usually, geodes are very round and lighter than normal rocks of a similar size. There are several methods and tools used for cutting open geodes. 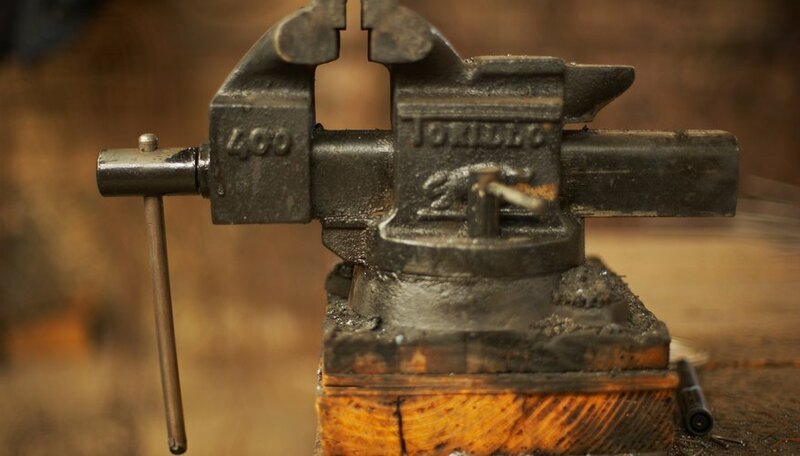 Place the geode rock in a carpenter’s vise and use a diamond saw to cut in half by sawing down the center. 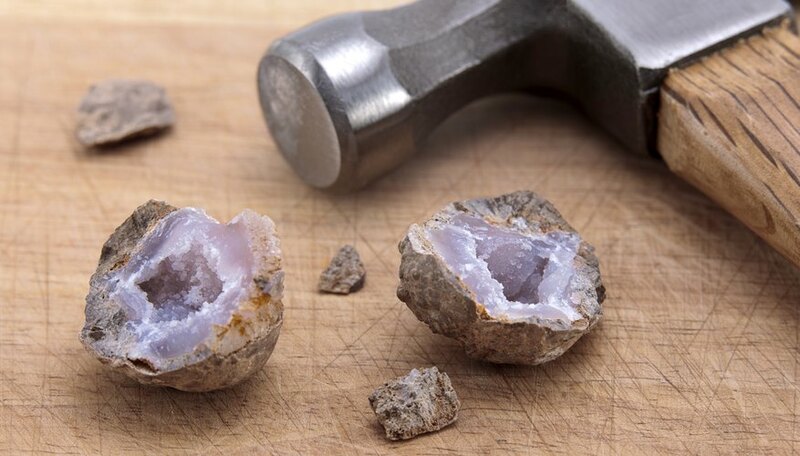 This is the most expensive yet easiest way to cut a geode. A diamond saw is a piece of expensive specialist equipment and the purchase of such should be reserved for the geode enthusiast who intends to cut hundreds of geodes rather than just one or two. Wrap the chain of an iron pipe cutter around the geode and attach on the correct notch on the tool before pushing down on the handle. This should cut the geode exactly in two although, like the diamond saw, is an expensive piece of equipment and not worth the money if the intention is only to cut one rock in half. Push a chisel point into the geode at four different points along the middle to mark out a circumference line. 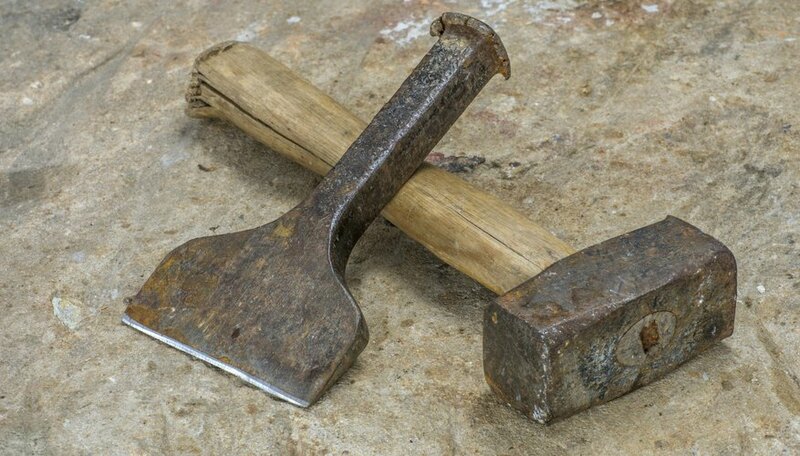 Tap the chisel gently with a metal claw hammer to punctuate the surface. 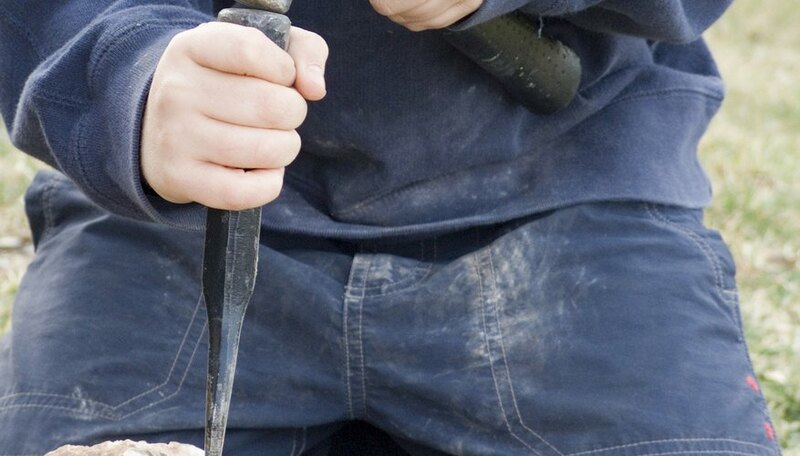 Use a stone chisel to lightly score the entire circumference of the geode. Use the sharp end of the chisel and just the strength of your own arm to make a small chip to create a dent around the entire stone. Chip so that the geode is separated by a line into two roughly equal parts. Repeat the chipping process but this time using the gentle assistance of a hammer. 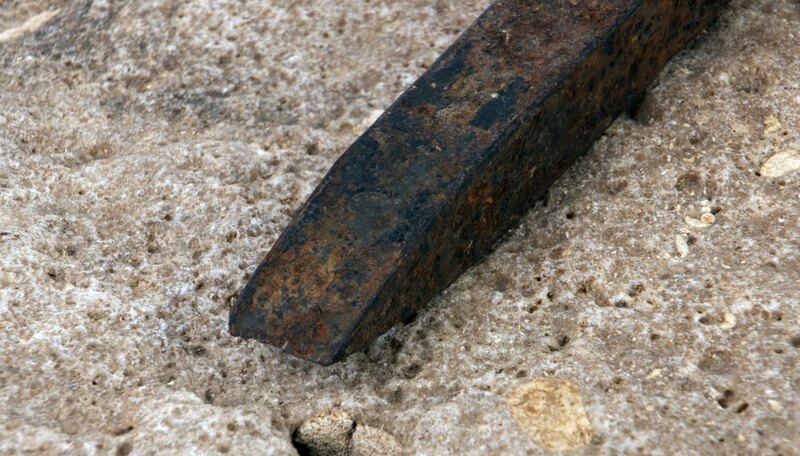 Be sure to tap gently on the blunt end of the chisel as you continue to work your way around the circumference of the stone. Place the rock on the ground outside to provide a hard surface for reverberation. Continue to work around the rock until a crack develops. Follow the crack around with gentle tapping on the chisel until the rock breaks in two. Be sure to wear safety goggles and shard-proof gloves when breaking stone. Avoid simple hitting the geode heavily with a hammer as this will shatter the stone and destroy any crystallization on the interior. Great South Gems and Minerals Inc.
Popovitch, Trish. "How to Cut a Geode." Sciencing, https://sciencing.com/cut-geode-5529327.html. 24 April 2017.